Finding the right truck for hire in Auckland can be a minefield. 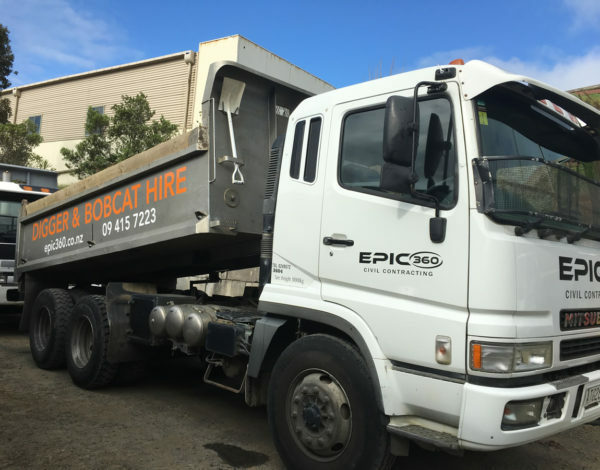 With an extensive fleet of trucks for hire, Auckland’s Epic 360 can provide vehicles for moving most aggregated loads. Specialising in ground works, Epic 360 are experienced experts in moving large loads, with the specialised trucks to ensure that there are no wasted trips. If you are not sure which the best truck to hire would be, call on the 35 years of experience our operators can provide. Included with the truck hire is a fully qualified, experienced operator, who can remove any earthwork spoil, including concrete, topsoil, aggregate or any other related debris (this service does not extend to contaminated materials) without delay. With an experienced operator as part of the service, we take the headache out of ground clearance projects, allowing your full attention to fall on the build. Epic 360 work to the highest ecological standards, cleaning and recycling spoil where possible, and disposing legally when it is not. Providing the full service from consultation to removal, customers are guaranteed a smooth journey, as we take absolute pride in providing great customer service; something that is testified to by our long standing clients, some lasting more than 20 years. Alongside our large fleet of carriage and removal trucks, Epic 360 also have diggers and excavators to assist with the project. Ranging from versatile, agile bobcats, capable of operating in the smallest sites, to commercial 10 Tonne diggers, Epic 360 can help with any ground working project. 30 years of experience ground working in Auckland and the North Shore have resulted in an excellent reputation, as well as lasting working relationships with some of the largest contractors and developers in the area, adding value to any level of involvement with your project. Customer service is right at the heart of all our truck hire operations in Auckland and the North Shore.